Last night, after what felt like an endless lead-up of promotion and handwringing from media critics, Megyn Kelly interviewed Alex Jones on her new show Sunday Night. The naysayers had good reason to doubt whether it was such a good idea for the NBC-via-Fox News star to bring America’s most influential conspiracy theorist on as the featured guest for last night’s episode. Some wondered whether it was ethical to give Jones a platform to spread his lies at all; more pertinent criticisms focused on the fact that Kelly, who first made her name spreading dubious ideas about voter intimidation by the New Black Panther Party and once had a paroxysm over the idea that imaginary Christmas characters could be represented by nonwhite people, is not exactly a paragon of journalistic integrity herself. Ultimately, the segment went as well as it possibly could have: Jones came off looking like the sputtering loon he is, but we didn’t learn anything new or interesting about him–with the exception, that is, of his anxiety about looking like a big sweaty idiot. 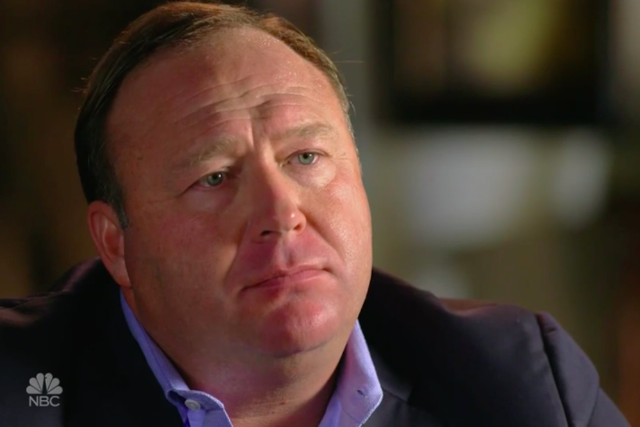 Kelly’s interview mixed Jones’s greatest hits with a selection of more recent lies: his contentions that the Sandy Hook massacre was a hoax and that 9/11 was an inside job, his propagation of the Pizzagate conspiracy, and the idea that the Chobani yogurt company had been “caught importing migrant rapists.” She made the argument, as many other commentators have done over the past year (including right here on this website, eight months ago) that Jones exerts a destabilizing and even dangerous influence on President Donald Trump and his supporters. Kelly’s critics believed that giving Jones an opportunity to make his case on prime-time television would allow him to convert more viewers to his brand of far-right paranoia, a point to which she and her producers reportedly conceded by recutting the interview for a more critical perspective in the days before it aired. That fear may have been misplaced. Without seeing the original draft, we can’t know how much influence that line of thinking actually had on the final product, but from the way Kelly unambiguously rebuked each of Jones’s talking points, it’s clear that she wanted to avoid the appearance of endorsing his views. It also strikes me that the population of Americans who have views that are amenable to the InfoWars party line, but who had not encountered Jones himself until unwinding after dinner with NBC News on the tube last night, is probably small to nonexistent. Besides, hardly anybody watched it anyway. Sunday Night With Megyn Kelly attracted just 3.5 million viewers last night, losing out in to 60 Minutes in the overall ratings and to a syndicated old episode of America’s Funniest Home Videos in the key 25-54 demographic. Still, there’s a certain bar of newsworthiness that Kelly failed to meet here, which would have helped to justify giving free exposure to such a toxic figure. No one who follows Jones would be surprised, enlightened, or even mildly amused by anything he said or did on her show. In the world of Alex Jones, there’s nothing at all that can’t be attributed to a shadowy liberal conspiracy. Whether it’s Justin Bieber or an effort to take away your guns, you can be sure that George Soros, the Clintons, the mainstream media, or some combination of the three are behind it. This is the governing philosophy of Alex Jones’s public life. The conspiracy, we learned last night, even extends as far as Alex Jones’s own sweat glands.